Follow in the footsteps of Rembrandt and explore the process of making an etching using a series of lines and different marks to build areas of detail, tone and texture. Suitable for all. Jamie will lead the participants through the process of choosing an image, preparation of the metal plate, and how to etch the plate using different lines, marks and textures. The group will then be instructed in different methods of inking the plate before printing, in order to create drama and depth in the print. Sketchbook drawings or reference photographs of the kind of Image you would like to create. 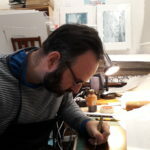 Jamie is a Freelance Curator and Printmaker based in Kendal. He has worked as a semi-professional printmaker for the last ten years and exhibits widely throughout the UK. In his work, he concentrates on etching and makes images about architecture, structures in the landscape and on the coast. He teaches printmaking and drawing to a variety of adult learning and school groups across the region.